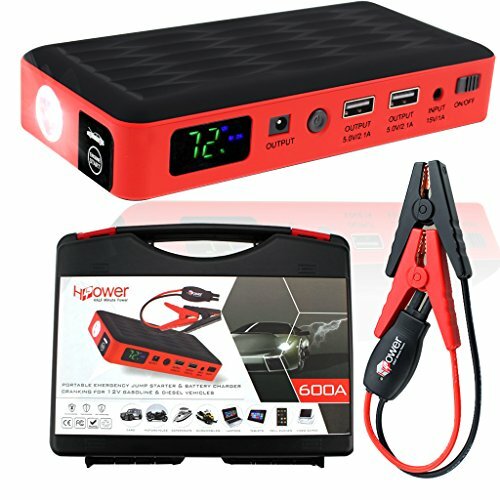 Real Capacity is 10500mAh, Unlike other jump starters in the market are just marked the unreliable mAh figure without explaining that depend on how many volts. As the "mAh" are not a fixed figure, which can change a little with voltage.600 Amp Peak Current - with enough power to jump start your car, motorcycle, boat, RV or tractor and so on. Our Fan-favorite 18-Month Warranty and Friendly Customer Service. 2. Due to the overheat protection function of the euipped smart cable, the SK06 battery booster cannot continue to restart your car many times. 【Portable and Attrative Design】You can easy to have it with you when you travel or on a business trip. Besides, it is also a excellent gift for your families and friends. 【Fashionable and Original LED Display】 Showing power level, output voltage and real-time current more clearly and easily. Besides, the service life of it is more longer than those of LCD Displays. 【Homemade and Spark-Proof Smart Cable】Multiple safety protection of short circuit , reverse connection, over-heat, over-current and etc. If you have any questions about this product by HALF Minute Power, contact us by completing and submitting the form below. If you are looking for a specif part number, please include it with your message.